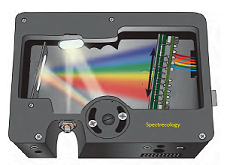 We sell UV, VIS, NIR and MIR spectrometers from Ocean Optics, our own dOpO2 oxygen sensor, UV-VIS light sources, fiber optics, sample holders, and spectroscopy standards. We invented the world's first miniature fiber optic spectrometer when we founded Ocean Optics in 1989, and we have developed over 2,500 fiber optic spectrometers, light sources, probes and chemical sensors in the years since. Zero Drift Sensors and DOpO2 electronicsare the most stable, optical based oxygen sensors available. Dissolved Oxygen (DO) Sensors, Process Oxygen Sensors, environmental O2 Sensors, Optical O2 Sensors for Fuels and hydrocarbons all operate from our phase fluorescence electronics. We have miniature and micro fiber optic spectrometers for all applications... low cost CMOS arrays, back-thinned CCDs, our premium cooled back thinned high quantum efficiency detector for demanding low noise applications, and our InGaAs arrays for NIR work.